Cooking Oil can be a complex topic. There is conflicting information, mainly due to the "fat" scare started in the 1980's and its association with weight loss. Walk down the aisles of any grocery store and you'll see packages feeding America's fear of fats with the NO FAT/LOW FAT claims. The intent here is not to analyze all the options of cooking oils and make a decision which is best. It is to provide some basic information to provide guidance. More information will be added over time and developed in the blog posts. Heavily processed fats and oils used in packaged foods are those fats that our bodies DO NOT know what to do with. Fat from high-quality oils and whole foods are used by our bodies to help keep metabolism steady, nourish our skin, hair and nails and keep enough healthy "grease" in our engine to have the body's functions work smoothly. However, fats are equal in certain regards. Fat contains nine calories per gram. Keep this in mind along with the recommendation that 20% - 35% of your calories should come from fats. For example, with a 2,000 calorie diet at 30% fats, this would be 600 calories from fats or nearly 67 grams. So be aware and read the labels. Dietary fats are essential to give your body energy and support cell growth and healing. It also hleps protect your organs and helps keep your body warm. There are four kinds of fats in foods: saturated fats, trans fats, monounsaturated fats and polyunsaturated fats. Generally speaking, saturated and trans fat are considered the "bad" fats and mono and poly unsaturated fats are the "good" fats. However, saturated fat is required in the diet so it does have some health benefits. Trans fat does not have any benefit and should be completely avoided. Expeller Pressed – Expeller pressing is a chemical-free mechanical process that extracts oil from seeds and nuts. The temperature reached during pressing depends on the hardness of the nut or seed. There is no external heat applied during the expeller pressing. When pressing is performed in temperature controlled environments to keep the heated generated down to a required level, the method is considered to be Cold Pressed. Chemical Processing - n - Hexane is a chemical made from crude oil. The major use for solvents containing n-hexane is to extract vegetable oils from crops. Hydrogenation - Adding of hydrogen while heating vegetable and seed oils and creates a rancid, thickened substance. Only benefits shelf life. Also called trans fats and labeled as partially hydrogenated. You do not want any oil to ripple or heat to the point of smoking. A simple way to know the proper temperature is just when you begin to smell the aroma. Try adding water to your oils when sauteing or stri-frys. Try to use cooking methods and/or cookware where the oil can be added after the dish is made (such as steaming). Unrefined and minimally processed fats are best for cooking. This includes real butter and coconut (if extra virgin). Avoid heavily, processed polyunsaturated fat (refined) as they are very unstable and cause harm to our bodies. This includes all vegetable oils (soybean, corn, cottonseed, safflower). When heating your cooking oils, you should be aware of the temperature. We don't recommend cooking on high temperatures since research shows that exposing oils to high heat results in the production of oxidized compounds. These create free radicals that are detrimental to your health. If cooking at high temperatures, try to do so for a limited time and utilze the saute' or stir-fry method of cooking. In recipes calling for oil, an option is to include it at the end depending on your cooking method. If added at the end, it not only maintains the health-promoting nutrients in the oil, but actually produces a much richer flavor. Flashpoint or Smoking Point, refers to the temperature that the oil will burn. 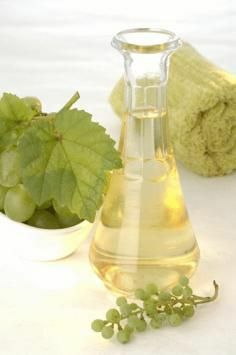 Due to its high flashpoint, grapeseed oil is considered to be a good selection. Keep oils in a cool, dark place - not on the counter, next to your stove or above the refrigerator...any place where it tends to be warmer. In most cases, oils are best kept in the refrigerator (especially those that are not to be heated when consumed). Check the label for the ideal storage temperature. When selecting oil, buy the highest quality you can afford, since they are the backbone of many dishes. Look for oils stored in dark bottles because oxygen, heat and light penetration will be limited.